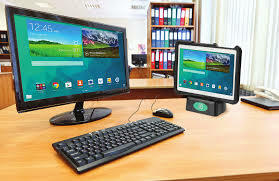 Positioning a device well is essential for optimal access and use. In some cases mounting from a wheelchair may be required. 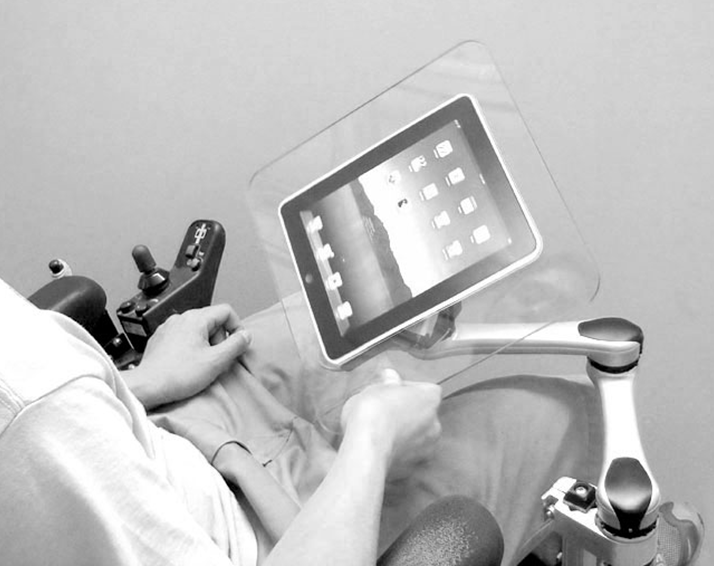 Although lots of different devices can be mounted to a wheelchair, this post focuses on some of the options available for mounting a tablet. 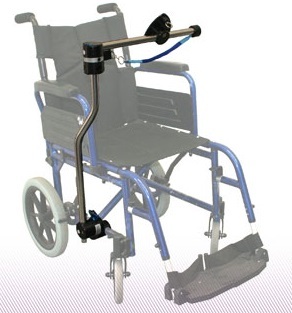 Daedalus Technologies main product is the Dassey mounting system which has a wide range of brackets, device adaptor plates and connecting bars that will fit most communication machines and tablets onto a wheelchairs. It’s a good option for mounting, but it’s a bit heavy duty for a light device such as an iPad. 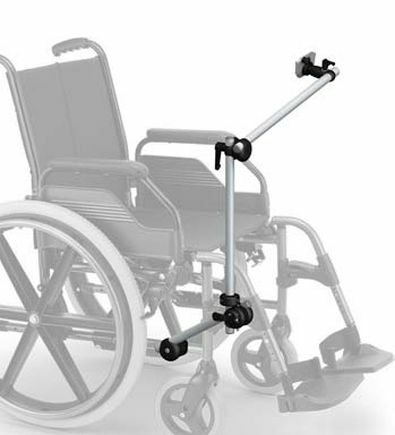 Daessy have a number of Standard Daessy Wheelchair Mounts that allow the mount to fold behind or to the side of the chair. They also have wheelchair mounts with the option for the user to release their mount to swing to the side and lock to out of position. If the user is able to reach a release-catch in fount of them, then swing away options may be suitable such as these two below. The DAESSY Locking Swing-Away Mount (DLSA7) The Locking Swing-Away Mount consists of a single length of tube bent to a right angle shape and supported in a clamp that allows the Mount to be swung away from the user in the manner of a gate. A Locking mechanism located at the clamp and operated by a cable running underneath the Mounted device controls the swing-away action. The Swing Aside Mount combines the features of the Locking Swing Away Mount (DLSA7) with the lockable frame clamp components. The mount can be swung away from the user by releasing the lock-pin connected to the cable that runs below the horizontal tube. As well as the Dassey standard mounts, custom solutions can be setup using their large range of components. 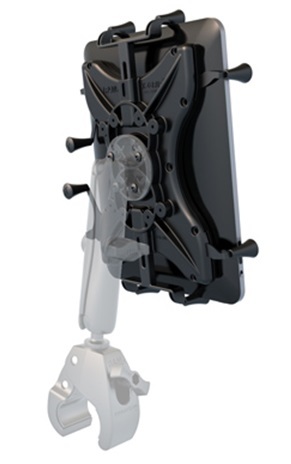 With Daessy mounts, the devices (iPads or other) can be quickly detached from the mount and the mount can be lifted completely out of the frame clamp for mount removal. 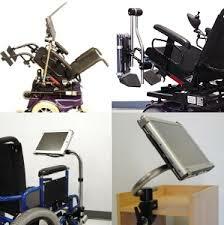 Rehadapt manufacture a number of options for wheelchair mounts. Again similar to Daessy it consists of poles and connecting joints. This is a good mounting system, light but quite expensive. Rehadapt’s Virtual Mounting Solution offers a way to see a virtual image of your mounting needs. First take a number of pictures from different angels of the location where mount is needed. 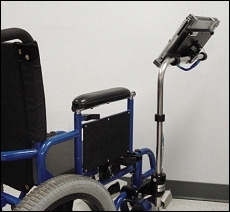 Then note details of the make and model of the wheelchair, details of the device or switch to be used, which side it is to go on and any other requirements. Email all off to the service. Rehadapt will then send back to you, a proposal of the mounting configuration including a superimposed image and a list of all parts needed. 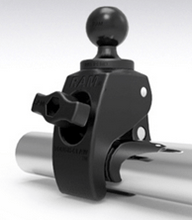 There are a number of useful clamps that could be used to attach to a wheelchair, such as the RAM Tough-Claw or the RAM Rail Base U-Bolt. Arms of various sizes can connect to these brackets as well as connected together with double ball adapters. 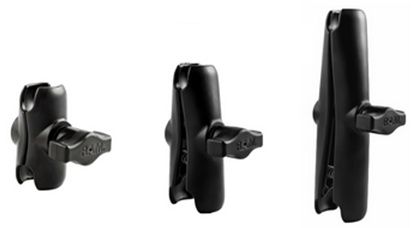 The RAM X-Grip range provides useful universal tablet holders.